If you have an old DSLR camera lying around, you could be putting it to work as a camera trap for photographing wildlife. A camera trap is simply a camera that fires automatically when an animal is detected. 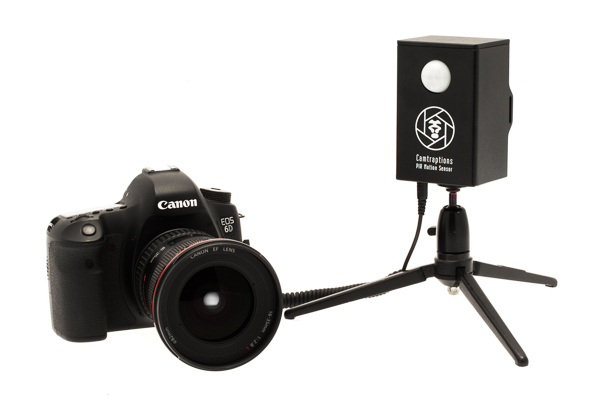 All you need in order to turn your DSLR into a camera trap is a sensor that can detect animals, then trigger your camera. Once set up, a camera trap can be left for days or even weeks at a time. The longer you leave it, the greater your chances of capturing a shot of an elusive animal. 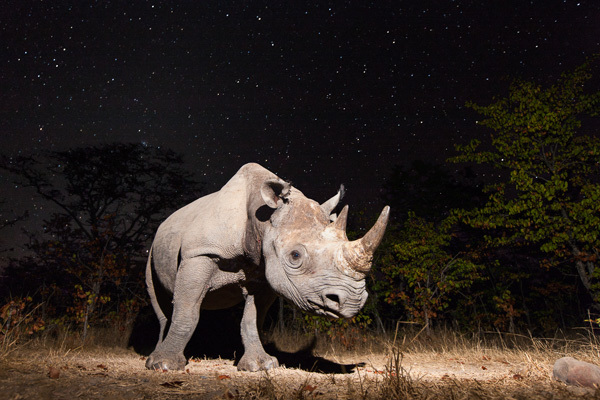 Black rhino at night in Zambia. A 30 second exposure time captured the stars. The rhino was illuminated by a flash at the start. I left my camera in the clearing for a week to capture this shot. 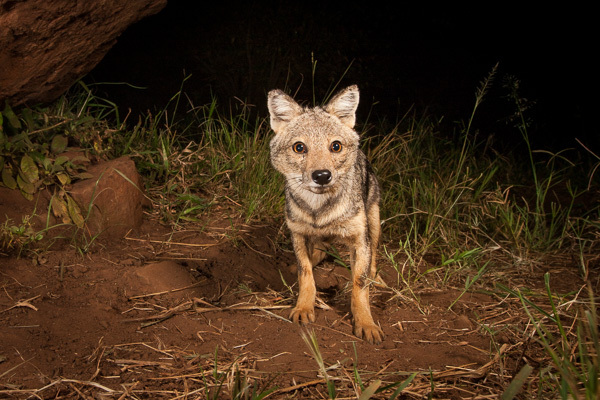 One of the main advantages of a camera trap is that you can take your time setting up off-camera flashes in order to achieve dramatically lit shots of nocturnal creatures. If you try to do this any other way, then the creature is likely to disappear well before you have finished setting up your lights! As a result of these benefits, camera traps have become a key tool for wildlife photographers aiming to photograph shy and nocturnal animals. So how do you set up a camera trap? First, dig out that old DSLR that you don’t use any more. I mostly use a Canon EOS 1Ds Mark III. Camera traps can get much closer to animals than a human holding a camera, so you can use a wide-angle lens. My preferred lens is a 17-40mm f/4 lens. Next, you need a way of detecting the animal and triggering your camera. If you are a handy, DIYer then you can do this by modifying a security device (I provide more information about how to do this on my website). The two most commonly used types of detector are beam-break and motion detectors. My preferred method of detecting animals is to use a Passive Infrared (PIR) motion sensor. This is similar to the sensor used on automatic patio security lights. I like these because they don’t consume much power, so they can remain on standby for a long period of time. They are also very easy to set up – you just point them at the trigger zone and wait for the animal to show up. Now you have the camera and the trigger sorted, the next thing you need is a speedlight (flash), or two, so that you can capture nocturnal subjects. I recommend setting up one or more off-camera flashes, connected to your camera with a TTL flash cord. It is important to get the flashes away from the camera itself because this will reduce redeye and make the shadows look more natural. Side-striped Jackal, Kidepo Valley, Uganda. This is an example of a dual flash setup, with a primary light source on the right and a fill flash on the left. I often just use one flash because I quite like dramatic shadows. However, sometimes, it is preferable to use a second flash to fill-in the shadows on the subject. If you want to get even fancier, you can also add more speedlights to illuminate the background. The challenge with camera traps is that you don’t know when the animal will pass and therefore the camera and flashes need to be programmed so that the scene is attractively exposed in any lighting condition. Here are some general settings that I find work well in most situations. Use manual focus and either low speed burst or single shot mode. Set the camera to aperture priority mode with a reasonably small aperture to provide a large depth of field. This means, if the animal isn’t quite in the right position, you should still get a sharp shot. A hippo and a bat in Zambia. 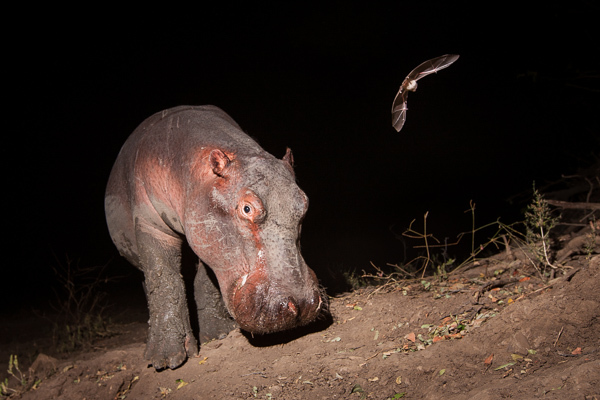 This was a lucky shot where the bat happened to be flying around the hippo. A small aperture ensured both animals were in focus. 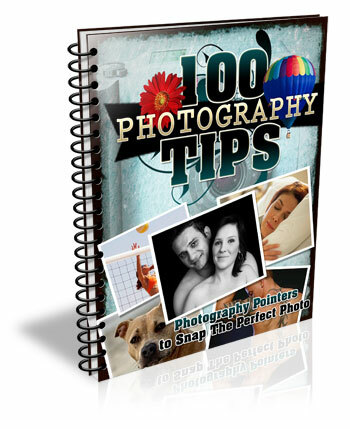 Selecting aperture priority means that in darkness, the camera will select a long shutter speed. This means it will capture details in the background such as twilight colours in the sky, or even stars. However, if there is too much ambient light, then you may get ghosting when the animal moves. If ghosting is a problem for you then, limiting the shutter speed to one second or faster can help. If I am using a single flash then I will leave it in TTL mode so the camera automatically determines the flash output based on its metering. For a multiple flash setup, it is usually easier to set the flash outputs manually. With manual flash output and your camera in Av mode, you may need to under-expose your camera (using exposure compensation) by a stop so that daylight images don’t blow-out. If you plan to leave you camera trap set up for more than a night, then battery life will be an issue. Make sure your camera is set to power off and that it can be woken by the sensor. I also recommend turning off the image preview to conserve battery. Your camera should now be able to last for many days, assuming it isn’t firing the whole time. Keeping your flashes powered is more challenging. Speedlights have a capacitor inside them which needs to be charged for the flash to fire. However, capacitors drain over time so flashes needs to constantly keep them topped up. If your flash isn’t set to sleep, then the batteries are likely to drain over the course of a single night. If your flashes are set to sleep then when you need them to fire, the capacitor may not have enough charge and so the flashes won’t be ready to fire immediately. Disable your flash’s sleep function – your flash will always be ready to fire but you will probably have to change the batteries every day, or power them with an external power supply. Use a flash that holds its charge well, even when sleeping. The best I know of is the Nikon SB-28, which can sleep for many days and still have enough charge in the capacitor to fire instantly. Set your camera to continuous drive mode and let your flashes sleep. The first and second shots may be black, but eventually your flashes will charge and fire. If you are letting your flashes sleep, then you will need to connect them to your camera via a TTL cable. This allows your camera to wake the flashes. You will need long cords and a TTL splitter hub if you want to fire multiple speedlights. Next you will need to find somewhere to set up your camera trap. The most productive places I have found are animal trails, particularly ones that cut through a difficult obstacle such as thick bush or a steep bank. I set my sensor up so that it covers a small section of the trail and then position the camera off to one side (so that it doesn’t block the animal’s path). 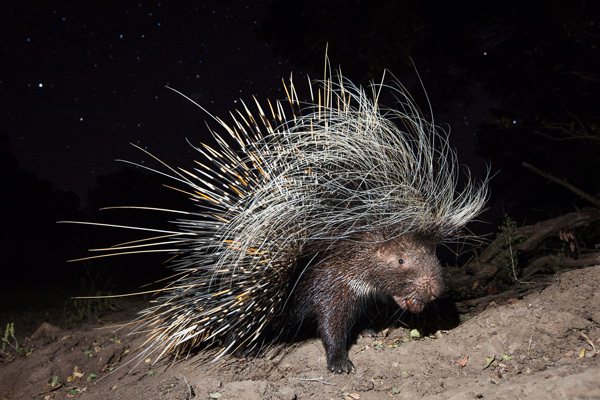 A porcupine photographed in Zambia. My camera was positioned next to an animal trail that lead up a steep bank. It captured many creatures including this porcupine. The last thing to do is to camouflage, waterproof, and protect your equipment. Rain covers can be made from plastic sheeting. If you need protection from animals such as hyenas and lions then you will need to buy or build your own protective housing. Once everything is set up, I recommend leaving your camera trap as long as possible in order to maximize the chances of getting results. You may just need to visit it from time to time to change batteries and check your settings. I have created a series of videos that help illustrate the process of setting up a camera trap. You can watch the first video in this series below. The post Turn your DSLR Camera into a Wildlife Camera Trap by William Burrard-Lucas appeared first on Digital Photography School. Next Post: Back Button Focus: What is it and why should you try it?